Home / battery skateboard / electric skateboard / electric unicycle / halo / Halo Board / Halo Rover / Hoverboard / Review / skateboard / tech board / Unboxing / video / Halo Board - The electric gyroscopic one wheeled skateboard that is like a mix between a hoverboard and a unicylce. 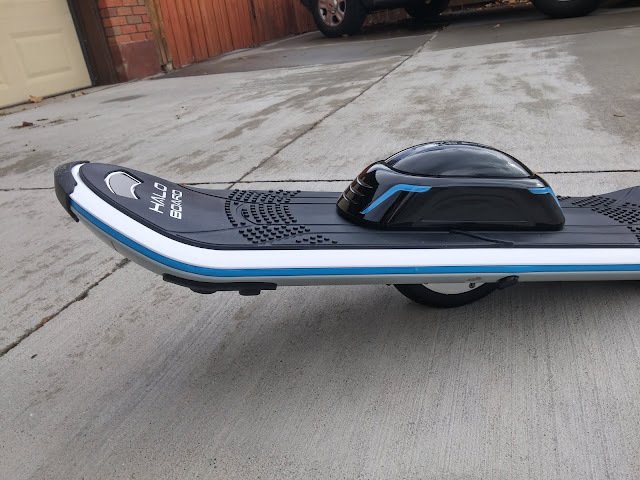 Halo Board - The electric gyroscopic one wheeled skateboard that is like a mix between a hoverboard and a unicylce. The best Christmas gift I received this past Christmas is by far the gift from Halo Board. The Halo Board looks like a skateboard but to me it feels more like what an actual hoverboard (you know... the real kind... like in "Back To the Future II") would feel like. It takes the kind of balance similar to a unicycle because you only have one main point of contact. There is a Youtube video that teaches you how to ride the Halo Board, basically by telling you to hold someone's hand. I was too impatient for that so I decided I would try it on my own. I will admit it was a bit difficult to first learn how to do anything besides looking like a complete fool. It took me about five tries before I could even move forward at all. Once I figured out how to stand on it, it got easier to move forward and with only a few more tries I was able to ride it about the length of my house. Overall, I would say it took about five minutes before I got to the point where I could feel comfortable stepping on it and going. That being said, I still don't feel like it is an extension of my body. Each time I step on, it takes a fair amount of concentration. This ought to go away the more I ride it... if only I had magical powers to make all the snow melt! In high school I learned how to ride the unicycle and this reminds me quite a bit of that learning experience. At first I could only go straight, then I could only make really wide turns. The more comfortable I got on this though the more I could make sharp turns and go more than a few feet without having to jump off. I found that this was indeed easier to ride when holding someones hand. Also, when first trying this, I was on a slight decline which turns out to be quite difficult. I recommend to make things easier when learning you place the board in a spot with a long open area (not indoors) and look for areas with slight inclines. I found this to be easier for me when trying to balance. The Halo Board looks really quite cool and I get a lot of curious stares everywhere I go with it. It has LEDs that light up all the way around the board that are not very noticeable in the daylight but it looks spectacular in the dark. I have spent a lot of time riding Hoverboards and think that this Halo Board is more fun probably because it is a lot more challenging. It is something that you can't get bored with after just a few hours because it takes you at least that long just to learn how to ride it well. When charging this I initially thought it might be broken because it did not do anything spectacular when I plugged it in but the charging unit itself has a small LED to indicate that it is charging. Red when charging, green when charged. I found that it actually to more than an hour to fully charge. 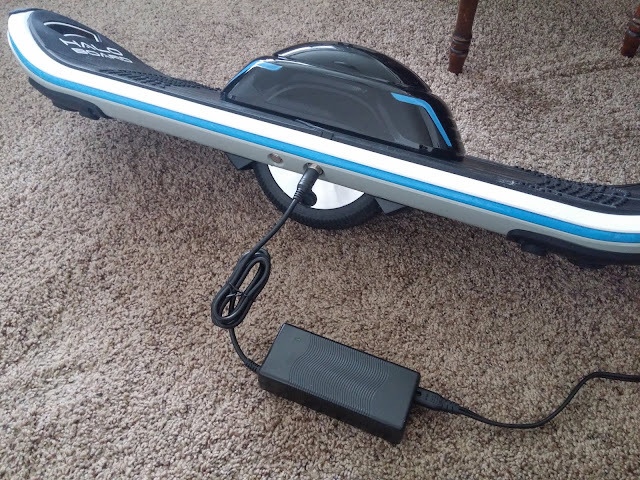 An hour charge though gives you plenty of time to ride the Halo Board. The wheel on the board is actually two wheels right next to each other. This is a good thing. It makes it easier to stay balanced but still enables you to cut and turn sharply if you want to. The board allows you to connect to Bluetooth so you can listen to music (or audio books if you are so inclined) from the built in speakers. For me, my favorite thing about the Halo Board is that it reminds me of my younger days when I would have to go outside and practice to actually learn a skill. It is not instant gratification. It actually takes work to learn. The more you practice, the more fun you have. If you have ever enjoyed skateboarding, snowboarding, unicycling, or if you are Marty McFly, then you will absolutely love the Halo Board! Wow, this looks cool. This must be an expensive one that I would like to know the price.